Regular activities taking place at Wereham Village Hall. Click here to see information about Community Groups. If your 2019 goal is to join a regular yoga class, or just take some time out to breathe ↠ The Beginners Series will teach you everything you need to know to get started with your practice. Over the course of this 10 week series, Gemma from Restore & More Yoga + Lucy from Sage & Soul Yoga will hold a safe space to guide you through foundational movements + sequences, breathing techniques + common language so that you gain the confidence to establish a home practice + progress onto a mixed ability class. You will also benefit from our combined teachings + knowledge. While this course is primarily aimed at beginners, it will also be a valuable tool to reconnect with the foundations if you’d like to improve + inform your existing practice. Every Wednesday in the hall. Doors open 6.30pm for eyes down at 7.30pm. Teas/Coffee/Snacks available before and during the interval. 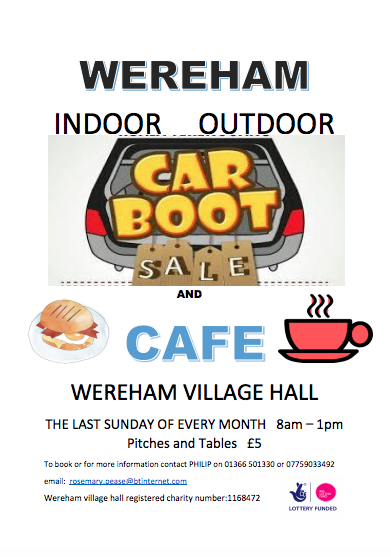 Wereham Car Boot and Cafe is held on the last Sunday of every month, 9am until 1pm. We serve Bacon Rolls, Sausage in a Roll or Egg in a Roll. There is always plenty of tea and coffee on offer. A Children’s Playground and a warm and friendly atmosphere within the village hall. 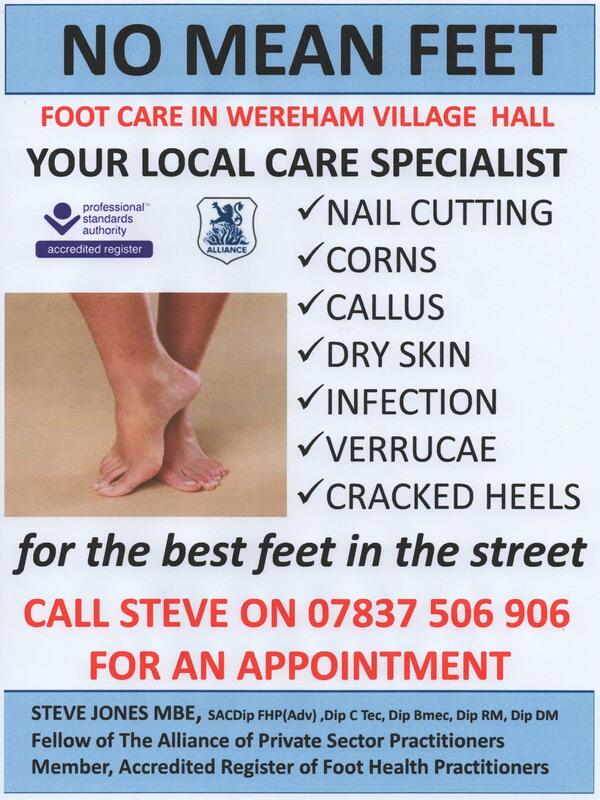 Steve Jones will be holding a foot clinic in the Village Hall next sessions are Monday 8th and Tuesday 9th of April 10am until 2pm. The clinic will return twice a month. If you would like to learn a new skill, we’re delivering exciting new learning activities in conjunction with Adult Education with a programme from February 2019. See our events here for new courses available. Ron will be teaching from Absolute beginner up to easy Improver level, starting very easy at the beginning of the lesson. Just come along to give it a go and enjoy dancing to all gender of music mainly country. £5 per class. Bring your own drinks and wear sensible shoes. Wereham Parish Council meets in the Community Room. For more information about the council and when they meet please visit their website. Every Tuesday morning 9.30 – 10.30am. Improve posture, core strength and balance. Increase flexibility and improve muscle tone. Improve joint mobility and circulation. Relieve stress and tension. Adaptable for all fitness levels – all you need is a mat and water bottle. Our Pop-up Café ‘pops-up’ in the main hall on the first and third Tuesday of each month, between 10.45am and 1.00pm, providing an invaluable opportunity for local residents to get together with each other, and with those from surrounding communities, to air views on local issues, organise social activities or simply catch-up on local gossip in a warm and friendly atmosphere. If you’re not feeling sociable that day, you’re always welcome to find yourself a quiet corner in which to sit with a freshly brewed cup of tea and a slice of cake and read the daily papers. 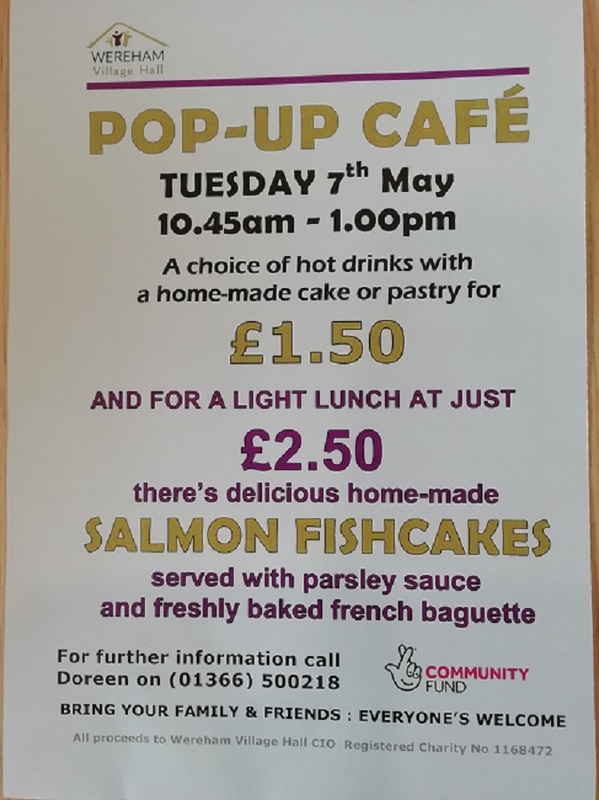 On offer at every Café is a choice of hot drinks, plus a selection of home-made cakes and pastries donated by members of the community, for the extremely affordable price of £1.50. From 11.30am until closing time at 1.00pm we broaden our bill of fare by serving a nourishing and seasonally appropriate light lunch ‘dish of the day’ for an additional £2.50. These are freshly made to order, and we seek to satisfy the needs of both carnivores and vegetarians. Previous offerings have included hot or cold soup with a freshly baked bread roll, toasted and filled panini rolls, ploughman’s lunch, omelette with a choice of fillings, fish cakes, spaghetti with a choice of sauces, kedgeree, toad-in-the-hole, stuffed giant mushrooms, baked jacket potato and cauliflower cheese. Every Tuesday evening 7 – 8:15 p.m.
Join Restore & More Yoga on a journey of Self Mastery as we gain the skills to choose our attitude, choose what we think + choose what we do. The Yamas + Niyamas are foundational to all yogic thought. Yoga is a sophisticated system that extends far beyond the physical yoga postures; it is literally a way of LIFE. We are now offering a class proving popular in other areas on a Friday afternoon 12.30pm until 1.30pm with our instructor Pete Baldwin. No previous experience necessary, the intensity is minimal and helps to develop movement and balance along with breathing and relaxation. Welcome to Wereham for your 7.1 Dolby Surround Sound cinematic experience! Launching November 2018, we’ll be showing the latest pre-DVD releases on our 4 metre full High Definition, wide screen projection system, with multiple speakers and sub speaker. (Please note that due to licencing, the cinema system is not available for private hire). Please click here to see latest listings. Lead Volunteer Jenny Simpson is creating opportunities for all ages and abilities to become physically active and improve their well-being. Gail Koopowitz. Yoga for Health Instructor. Fully certified with the Yoga Alliance and qualified to teach Remedial and Antenatal and Postnatal Yoga, I have many years of yoga teaching experience. 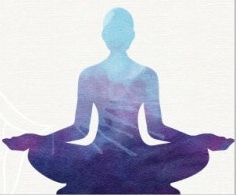 Hatha Yoga recognises that each individual is at a unique point in their own life, with their own skeletal and muscular imbalance. We work with the breath, the body and the mind and aim to practice to become more “balanced”, more aware of how we conduct ourselves, physically, emotionally, mentally and spiritually so that we can become more compassionate both to ourselves and others. Thus, we walk more softly and healthily on this earth, being more in tune with ourselves and others. If you are keen to try a session please contact me so that I can find the correct class to suit your needs. A fun dance-fitness programme with Domonique Houghton, incorporating a variety of dance rhythms to create a dynamic, exciting and effective fitness workout for all ages and abilities. Domonique is a fully trained, qualified and experienced Zumba and Zumba Gold teacher whose aim is to make every class feel like a party.